The IRS has data on estate taxes which breaks down the nature of the assets. Estate taxes for 2012 the latest year with data is only applicable to estates with over $5 million in value. 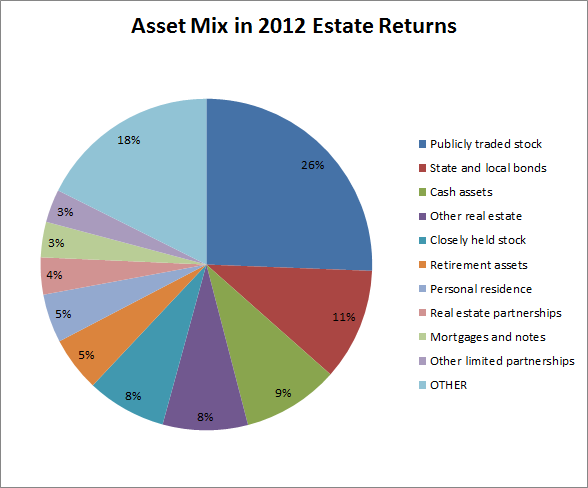 Therefore if we look at the estate tax data we can get a sample of the asset mix of multi-millionaires in the US. The information is going to be skewed towards older people as these are for the estates of deceased people. Roughly speaking stocks and bonds of various types make up about half the assets. Looks like real estate including personal homes is around 20% ballpark. The remaining 30% is a mix of various things.